Monica Brady and Gertie Fee were victors for North/South, 2nd Seamus Kennedy and Pauric Gleeson, 3rd Maura Gaskin and Clare Sally and 4th Nancy O Brien and Catherine Halligan. Catherine McGillycuddy and Bridie Nolan took 1st place for East/West, 2nd Teresa Leahy and Marian Davies, 3rd Phil Power and Brid Clancy and 4th Ger Lenihan and Paddy O Brien. Friday 13th certainly didnt prove unlucky for Molly Byrne and Rachel Judd as they took 1st place for North/South, 2nd Nancy O Brien and Catherine McGillycuddy, 3rd June Digby and Monica Brady and 4th Seamus Kennedy and John Loscher. 1st for East/West were Maura Gaskin and Bridie Nolan, 2nd Maria Magee and Rowena Brady, 3rd Liz Belton and Phil Kenna and 4th Paddy O Brien and Ger Lenihan. The community games athletics run off will take place Wednesday 25th April @ An Tochar Gaa, please be there 5.30 for a 5.45 start. Cycling on grass will take place on Friday 27th @ An Tochar Gaa, 6pm. There will be a cover charge of €2 per athlete or €5 per family. It is the parent/guardian responsibly to ensure their children compete in the correct age category. Age cut off for community games events is 31st July.More details on our what’sapp group, if you would like to be added to the group please contact Seamus Doyle 086 855 7962 or Brenda Fox 086 852 1507. Moneystown Midsummer Barn Dance and BBQ will take place on 30th June in Moneystown Community Centre starting at 8pm till late. Music by the Roamin Cadiliacs and the Whole Hog. Fully licensed. Takes place in the Wicklow Mountains National Park on Sunday 29th April at 11am. Learn about the management issues of the National Park on a hike of 3-5 hours. Suitable for adults and teenagers who must bring hiking footwear, rain gear & a pack lunch. Places are limited. Pre-booking is essential by calling 0404 45425 or 0404 45656. Meeting at the Information Office near the Upper Lake in Glendalough. This entry was posted in News & Events on April 18, 2018 by roundwoodiewicklow. The Wicklow Man will play in Moneystown Community Centre on Friday April 13, from 9.30 pm – 12. Teas served, refreshments also available, door prizes. Come along and enjoy a night of waltzing, jive, etc. As part of the annual Spring Clean Campaign everyone is encouraged to get out on Saturday April 14th to pick litter along their stretch of road or estate in the Roundwood/Moneystown area. Why not join up with the neighbours and keep passing on the rubbish bag until you reach the end of your road. 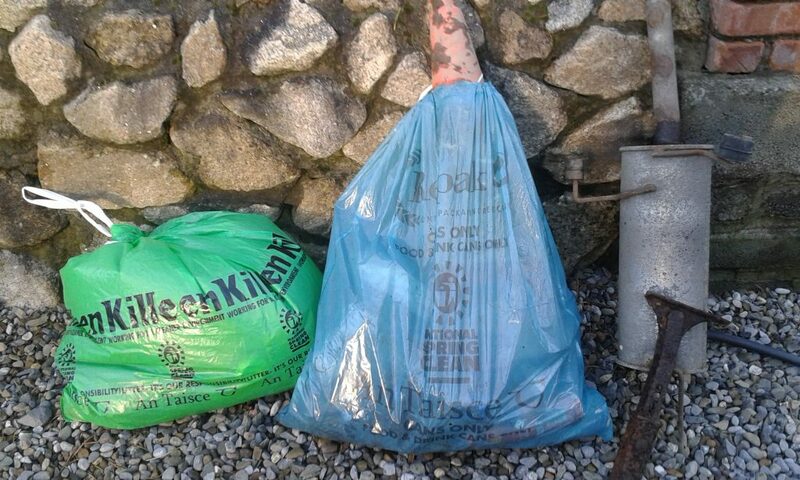 If you need rubbish bags, a litter picker or gloves please call 086 8055040! Every little helps! Jenny’s Pre-School is now accepting enrolments for September 2018/2019. If you require any further information please do not hesitate to contact Jenny on 0868766301 or email us on jennyspreschoolmoneystown@gmail.com, or call into the Pre-School for an application form any morning. This entry was posted in News & Events on April 9, 2018 by roundwoodiewicklow. Tired of looking at bits of plastic bags, bottles, cable ties and all manner of trash along your road? All too often the focus is on our towns and villages when really it’s the litter strewn across our countryside that brings our clean, green image down to a new low. The Roundwood and District Community Council are organising a Parish wide clean up this year on the 14th of April & are seeking your assistance in your particular area. Now it’s time for action! In association with the An Taisce Spring Clean initiative Roundwood and Moneystown are making plans to have a major clean up on all the highways and byways of the area. Saturday 14th of April is the designated day when all residents of the area are encouraged to head out their gates and pick any litter to be seen between their house and the next. Pass on the refuse sack to the next able bodied neighbour until the last resident or representative of your road hits Roundwood village where all the bags will be collected and brought for recycling or to landfill. It’s a great time of year to do this as the hedgerow vegetation is low and the litter that is embedded in the ditches is all too visible. If you can’t do the 14th of April – any time this month is perfect! Where it’s practical all plastics, glass and other recyclables should be bagged together for recycling. If your bag gets too heavy, no sweat – just call and to arrange collection by a local volunteer. This entry was posted in News & Events on April 5, 2018 by roundwoodiewicklow.